Die Veneris, videlicet, 15 die Julii. Letter from Secretary Nicholas, returning the Scots Treaty with Amendments by the King. L. Slingsby versus Sir Faithful Fortescue. Col. Butler committed to The Gatehouse. 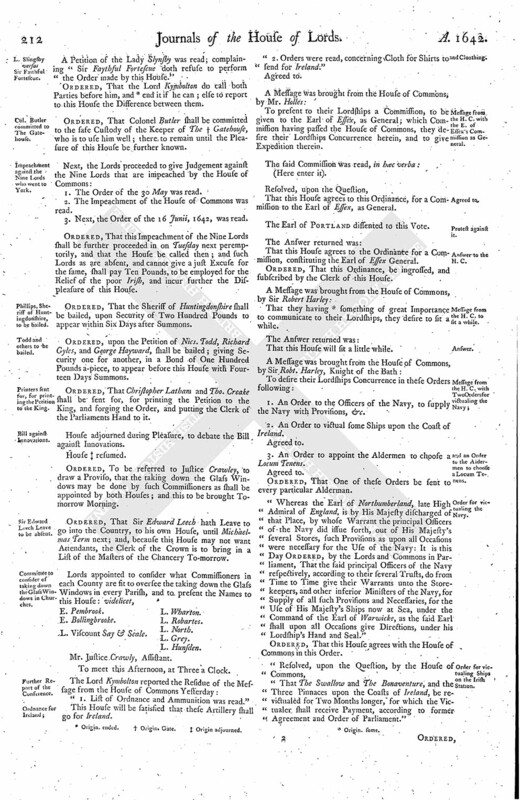 Impeachment against the Nine Lords who went to York. Phillips, Sheriff of Huntingdonshire, to be bailed. Todd and others to be bailed. Printers sent for, for printing the Petition to the King. Sir Edward Leech Leave to be absent. Committee to consider of taking down the Glass Windows in Churches. Further Report of the Conference. Message from the H. C. with the E. of Essex's Commission as General. Message from the H. C. to sit a while. and an Order to the Aldermen to choose a Locum Tenens. Order for victualing the Navy. Order for victualing Ships on the Irish Station. Order for the Aldermen of London to chuse a Locum Tenens, during the Lord Mayor's Confinement. Wollaston and Aldworth's Contract for Shirts for Ireland. Order for Money to the Contractors. Earl Leycester excused for his Absence, being not well. Ordered, That the Cause between Watkins and Warde shall be heard in this House this Day Sevennight. "Your Lordships Most humble Servant, Edw. Nicholas." 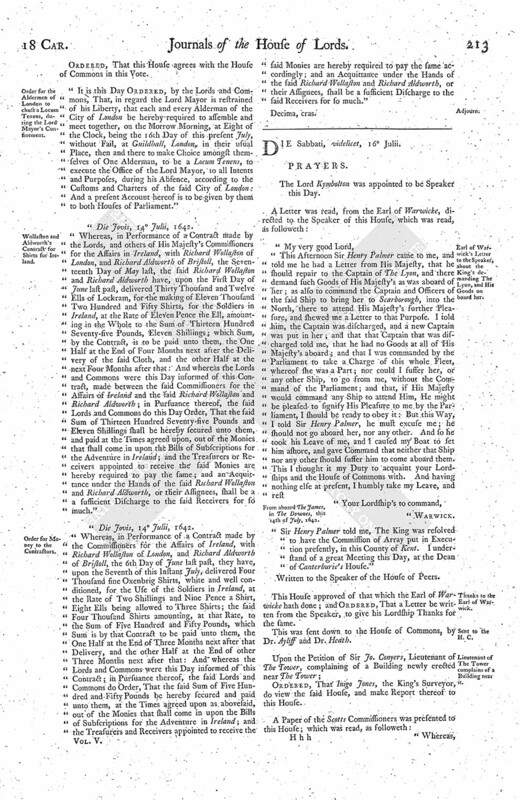 The Amendments in the several Articles of the Scotts Treaty were read. Ordered, That the Treaty and the Letter shall be sent down to the House of Commons, to communicate it unto them; which were (fn. 1) accordingly sent, by Message, by Sir Edw. Leech and Dr. Ayloffe. A Petition of the Lady Slynsby was read; complaining "Sir Faythful Fortescue doth refuse to perform the Order made by this House." Ordered, That the Lord Kymbolton do call both Parties before him, and (fn. 2) end it if he can; else to report to this House the Difference between them. Ordered, That Colonel Butler shall be committed to the safe Custody of the Keeper of The (fn. 3) Gatehouse, who is to use him well; there to remain until the Pleasure of this House be further known. 1. The Order of the 30 May was read. 2. The Impeachment of the House of Commons was read. 3. Next, the Order of the 16 Junii, 1642, was read. Ordered, That this Impeachment of the Nine Lords shall be further proceeded in on Tuesday next peremptorily, and that the House be called then; and such Lords as are absent, and cannot give a just Excuse for the same, shall pay Ten Pounds, to be employed for the Relief of the poor Irish, and incur further the Displeasure of this House. Ordered, That the Sheriff of Huntingdonshire shall be bailed, upon Security of Two Hundred Pounds to appear within Six Days after Summons. Ordered, upon the Petition of Nics. Todd, Richard Gyles, and George Hayward, shall be bailed; giving Security one for another, in a Bond of One Hundred Pounds a-piece, to appear before this House with Fourteen Days Summons. Ordered, That Christopher Latham and Tho. Creake shall be sent for, for printing the Petition to the King, and forging the Order, and putting the Clerk of the Parliaments Hand to it. House adjourned during Pleasure, to debate the Bill against Innovations. Ordered, To be referred to Justice Crawley, to draw a Proviso, that the taking down the Glass Windows may be done by such Commissioners as shall be appointed by both Houses; and this to be brought Tomorrow Morning. Ordered, That Sir Edward Leech hath Leave to go into the Country, to his own House, until Michaelmas Term next; and, because this House may not want Attendants, the Clerk of the Crown is to bring in a List of the Masters of the Chancery To-morrow. L. Viscount Say & Seale. L. Wharton. To meet this Afternoon, at Three a Clock. "1. List of Ordnance and Ammunition was read." This House will be satisfied that these Artillery shall go for Ireland. "2. Orders were read, concerning Cloth for Shirts to send for Ireland." To present to their Lordships a Commission, to be given to the Earl of Essex, as General; which Commission having passed the House of Commons, they desire their Lordships Concurrence herein, and to give Expedition therein. That this House agrees to this Ordinance, for a Commission to the Earl of Essex, as General. The Earl of Portland dissented to this Vote. That this House agrees to the Ordinanee for a Commission, constituting the Earl of Essex General. Ordered, That this Ordinance, be ingrossed, and subscribed by the Clerk of this House. That they having (fn. 5) something of great Importance to communicate to their Lordships, they desire to sit a while. That this House will sit a little while. 1. An Order to the Officers of the Navy, to supply the Navy with Provisions, &c.
2. An Order to victual some Ships upon the Coast of Ireland. 3. An Order to appoint the Aldermen to choose a Locum Tenens. Ordered, That One of these Orders be sent to every particular Alderman. "Whereas the Earl of Northumberland, late High Admiral of England, is by His Majesty discharged of that Place, by whose Warrant the principal Officers of the Navy did issue forth, out of His Majesty's several Stores, such Provisions as upon all Occasions were necessary for the Use of the Navy: It is this Day Ordered, by the Lords and Commons in Parliament, That the said principal Officers of the Navy respectively, according to their several Trusts, do from Time to Time give their Warrants unto the Storekeepers, and other inferior Ministers of the Navy, for Supply of all such Provisions and Necessaries, for the Use of His Majesty's Ships now at Sea, under the Command of the Earl of Warwicke, as the said Earl shall upon all Occasions give Directions, under his Lordship's Hand and Seal." "That The Swallow and The Bonaventure, and the Three Pinnaces upon the Coasts of Ireland, be revictualed for Two Months longer, for which the Victualer shall receive Payment, according to former Agreement and Order of Parliament." "It is this Day Ordered, by the Lords and Commons, That, in regard the Lord Mayor is restrained of his Liberty, that each and every Alderman of the City of London be hereby required to assemble and meet together, on the Morrow Morning, at Eight of the Clock, being the 16th Day of this present July, without Fail, at Guildhall, London, in their usual Place, then and there to make Choice amongst themselves of One Alderman, to be a Locum Tenens, to execute the Office of the Lord Mayor, to all Intents and Purposes, during his Absence, according to the Customs and Charters of the said City of London: And a present Account hereof is to be given by them to both Houses of Parliament." Die Jovis, 14 Julii, 1642. 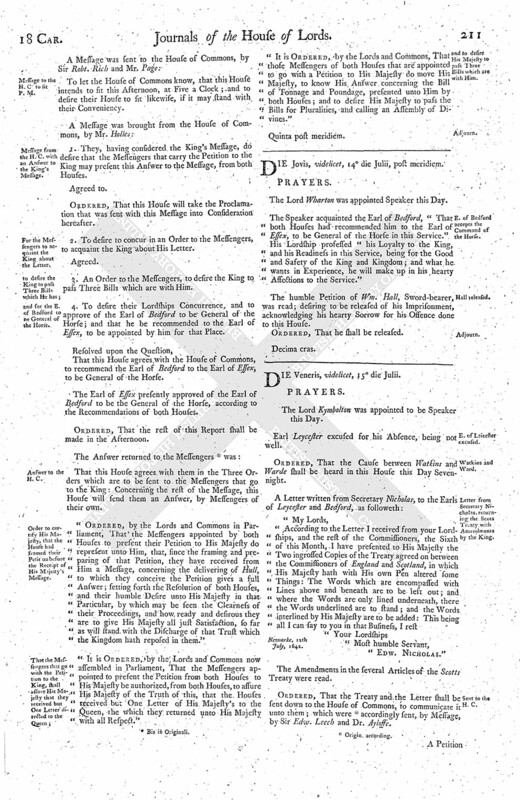 "Whereas, in Performance of a Contract made by the Lords, and others of His Majesty's Commissioners for the Affairs in Ireland, with Richard Wollaston of London, and Richard Aldworth of Bristoll, the Seventeenth Day of May last, the said Richard Wollaston and Richard Aldworth have, upon the First Day of June last past, delivered Thirty Thousand and Twelve Ells of Lockram, for the making of Eleven Thousand Two Hundred and Fifty Shirts, for the Soldiers in Ireland, at the Rate of Eleven Pence the Ell, amounting in the Whole to the Sum of Thirteen Hundred Seventy-five Pounds, Eleven Shillings; which Sum, by the Contract, is to be paid unto them, the One Half at the End of Four Months next after the Delivery of the said Cloth, and the other Half at the next Four Months after that: And whereas the Lords and Commons were this Day informed of this Contract, made between the said Commissioners for the Affairs of Ireland and the said Richard Wollaston and Richard Aldworth; in Pursuance thereof, the said Lords and Commons do this Day Order, That the said Sum of Thirteen Hundred Seventy-five Pounds and Eleven Shillings shall be hereby secured unto them, and paid at the Times agreed upon, out of the Monies that shall come in upon the Bills of Subscriptions for the Adventure in Ireland; and the Treasurers or Receivers appointed to receive the said Monies are hereby required to pay the same; and an Acquittance under the Hands of the said Richard Wollaston and Richard Aldworth, or their Assignees, shall be a a sufficient Discharge to the said Receivers for so much." "Whereas, in Performance of a Contract made by the Commissioners for the Affairs of Ireland, with Richard Wollaston of London, and Richard Aldworth of Bristoll, the 6th Day of June last past, they have, upon the Seventh of this Instant July, delivered Four Thousand fine Oxenbrig Shirts, white and well conditioned, for the Use of the Soldiers in Ireland, at the Rate of Two Shillings and Nine Pence a Shirt, Eight Ells being allowed to Three Shirts; the said Four Thousand Shirts amounting, at that Rate, to the Sum of Five Hundred and Fifty Pounds, which Sum is by that Contract to be paid unto them, the One Half at the End of Three Months next after that Delivery, and the other Half at the End of other Three Months next after that: And whereas the Lords and Commons were this Day informed of this Contract; in Pursuance thereof, the said Lords and Commons do Order, That the said Sum of Five Hundred and Fifty Pounds be hereby secured and paid unto them, at the Times agreed upon as abovesaid, out of the Monies that shall come in upon the Bills of Subscriptions for the Adventure in Ireland; and the Treasurers and Receivers appointed to receive the said Monies are hereby required to pay the same accordingly; and an Acquittance under the Hands of the said Richard Wollaston and Richard Aldworth, or their Assignees, shall be a sufficient Discharge to the said Receivers for so much."